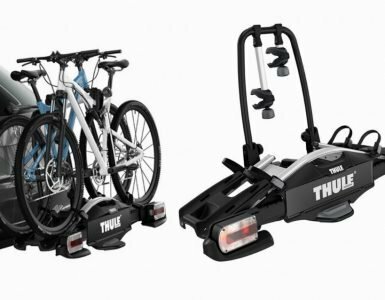 When considering a truck bed bike rack you’ll need to think about the number of bikes you wish to carry, the size of the bikes and the easiest way of getting them on and off your truck. Of course, security should also be considered as well as minimizing the chances of damaging your truck or your bikes. That’s why it was surprisingly pleasing to review the Ride88 truck bed bike rack. 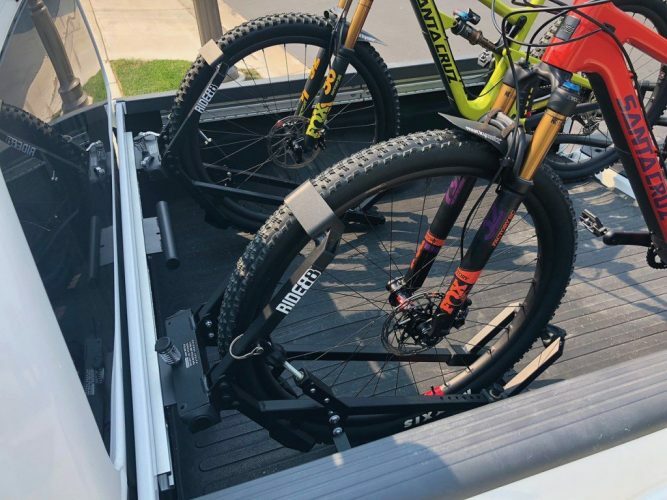 The Bike 88 truck bed bike rack was designed by Jerry Lathrop as a direct result of purchasing a ‘nice’ bike. The design took time to complete and is now patented; proving that it is both unique and works. But, the real plus point of this is that this bike rack has been designed by someone who actually carries bikes in the back of their truck. It’s this fact that makes this such an intriguing and viable option. 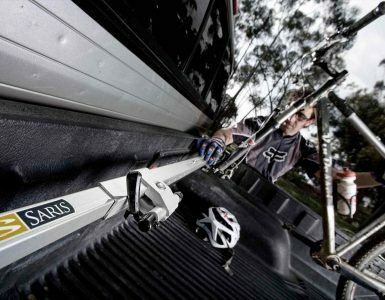 Hitch bike racks add length to your truck. They are not always easy to load and they can reduce your visibility when driving. If you have a truck bed there is little point in getting this style of rack. The Ride88 rack uses a simple compression style extension bar which can be fitted without the need to drill holes in your truck. In addition, a quick release system means that your bikes can be slotted into position in moments without having to take wheels or any other bike parts off. The first step of installing your Ride88 truck bed bike rack is to slot the quick bar into your truck. It sits behind the cab and slots into your standard toolbox mounting holes. This can be fitted in a matter of minutes and is as secure as mounting a toolbox. You then put two clips onto the crossbar. The bike rack assembly slots onto these clips. Through each one is a screw mounted to a quick release style handle. Simply tighten these and pull the handle downwards to lock the assembly in position on the bar. It is possible to slide the assembly into any position on the bar before tightening. An extra pin style bolt slides through the middle of this to ensure it is held firmly in place. For security, you can actually remove the quick release handles after the bike is in position; making it difficult to remove the rack assembly. A single lever holds your bike securely in place. The design of this truck bed bike rack is ingenious and actually incredibly simple. All you need to do is push the front wheel of your bike into the rack assembly. A large lever on the left can then be pulled bringing the top clamp down onto your tire. That’s it! Your bike is then locked into position. Best of all this seems to be enough to hold your bike securely while driving; there is no need for extra tie downs. A full-size truck can take 5 racks on one crossbar; making it possible to carry 5 bikes in the back of your truck effortlessly. 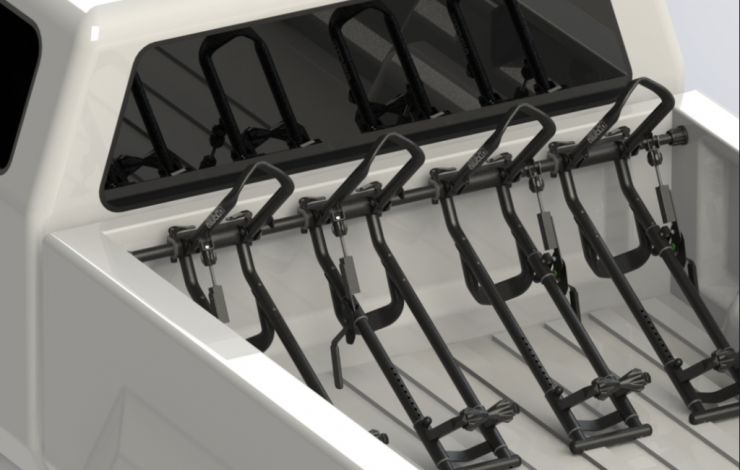 It should be noted that each rack is designed to take bikes up to 80 pounds; that’s significantly more than many bike racks on offer. 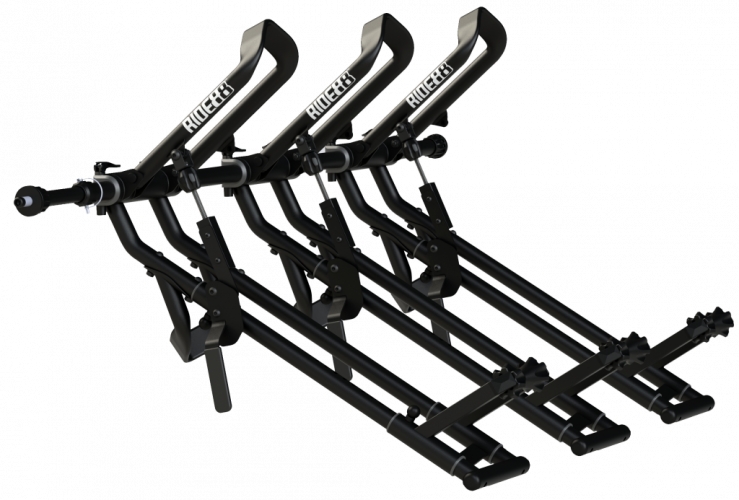 The crossbar clips effortlessly into your truck bed and allows you to add just one bike holder or as many as 5; you can purchase these individually as your needs change. The alternative is to purchase the bike support and a mounting plate. This plate can be bolted to your truck; you may need to drill holes for this. Alternatively, you mount this onto the OEM utility track system; meaning that you may not need to drill any holes in your truck bed. The Ride88 truck bed bike rack is a new and exciting option for carrying your bike or bikes. To help raise the necessary start-up funds the company launched a Kickstarter campaign and offered a discount on preliminary orders. Unfortunately, this campaign was unsuccessful but the fact that Ride88 continued and found a way to start producing these racks shows their commitment and the potential of these racks. The rack in its previous form couldn’t handle 4” wheels but not 5” ones. The latest QR3 version however now fully supports 5″ tires. This is something that is being looked at and likely to change in the near future. In addition to this encouraging news, it’s possible to get an adaption kit that will allow you to put a BMX into your rack. The kit will allow the clamp to lock onto the smaller wheels. In theory, this should also allow you to include a small child’s bike. You drive your wheel into the rack and then clamp it into position with the large lever. This is great for simplicity but it will be possible for anyone to release this lever and remove the bike. If you’re simply taking the bike to a ride and back this is not likely to be an issue. However, if you’re leaving your bike in the truck when you’re away from your vehicle you will need to use a standard locking cable to protect your bike. Considering the innovative design it is reasonable to believe that the rack will feature an inbuilt lock in the future. We do supply security lock systems for the bikes and racks. The reason we do not bother to lock the arm is because the skewer can simply be removed from the wheel to steel a bike. We wanted more real security then that. All bike racks require you to lift your bike onto them. If you have a truck then you’re probably already aware of the weight of your bike and if it is easy to lift into your truck or not. In reality, this s not an issue with the Ride88 rack but it is something to be aware of. This is a new product on the market and shows some serious promise. However, it is important to note that as a new product there is limited customer feedback to confirm how well this rack stands the test of time. Again this is not necessarily a disadvantage of the rack; the current approach by Ride88 suggests that any issues will be speedily dealt with for existing and new customers. There are plenty of options on the market if you’re looking for a truck bed bike rack. 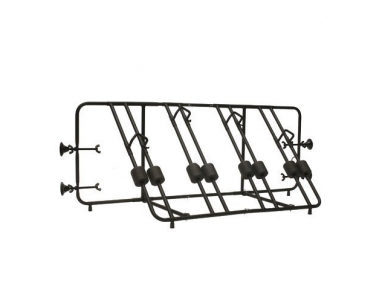 However, the Ride88 truck bed bike rack is an exciting, affordable option. In fact, it has the potential to be the best truck bed bike rack available. It’s definitely worth taking a look at one today.